Packing for something new can be challenging—but we’ve got you covered. 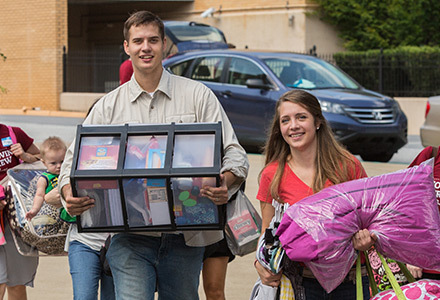 We checked with students who’ve had lots of experience packing for the school year. Their advice: if it doesn’t have a practical use, don’t bring it. To save room, you may want to wait until you get here to buy certain products like detergent or hangers. There are plenty of shopping options here in Greenville. You may also want to save room in your car by shipping your items ahead of time. Check out the list below for ideas about what to pack. Check out our student handbook for some clothing guidelines you’ll want to keep in mind. As hard as it is to spend the money up front, it’d probably be worth your comfort to invest in a nice pair of durable, comfortable shoes for everyday wear. You’ll want to bring church/formal event shoes and athletic shoes too. Don’t forget the shower shoes and flip-flops or slippers for the residence hall. Printers are available across campus, and full-time students have an allowance of $30 each semester for printing. Personal printers require a wired connection. Talk with your roommates about some shareable stuff for the room. That way you won’t have extra stuff taking up space. You can bring refrigerators or thermoelectric coolers under 4.5 cubic feet. Best to leave the valuable stuff at home. Other Requirements Certain programs such as engineering, computer science, graphic design and nursing may have additional requirements. Please check with your advisor. Students who are employed by an off-site company and who need special network privileges to continue this employment may submit a request online after Check-In. Students will need to know the domain and IP address. Access is set up the 2nd or 3rd week of the semester. Access is granted for the entire school year. If any part of the request is missing or incorrect, access will be delayed. Access is available only through a wired port in the residence halls. Access is provided as a convenience. Technology Resources does not provide support beyond ensuring that access to all the services requested has been made available. Greenville, SC 29609 Items will be delivered to your residence hall room. Greenville, SC 29614 Pick up letters at your campus post office box and small packages at the university post office. Greenville, SC 29614 Pick up letters at your campus post office box and packages at the university post office. * After Aug. 1, you can log on to StudentCentral and find your campus post office box number on your profile page. Be sure to communicate your box number to your parents and others who will send letters and packages to you. BJU doesn’t maintain insurance to cover your personal possessions. If you want coverage of this type, you should contact your local insurance agent. If your parents have a homeowner’s policy, you may already be covered.